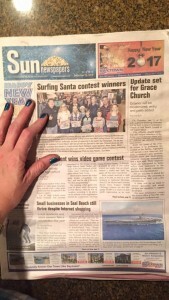 This week’s Sun News in Seal Beach, Calif., carries a front page story about a groundbreaking event next week at Grace Community Church, Seal Beach (Steve Williams, senior pastor). The church is beginning what they call Wave 3, the third and final project in a series of projects to renew and maximize their land-locked facility. Below is a portion of a report on the project from the church’s newsletter. About a decade ago, after discovering that we could not build a larger sanctuary here, our church decided to renew and maximize our buildings for ministry through a series of mid-sized renovation projects, which we called “Waves.” Wave 1 was the renewal of our worship space and lobby, the Surfside Chapel, and the Offshore Room. Wave 2 was the renewal of the Children’s area and office space. These renovations have been a benefit to the ministries that meet in them, but they aren’t visible to those in our community. From the outside of our building, Grace looks like a church stuck in the past with no plan for the future. But that’s not who we are! So, what are going to do about it? Wave 3 is the renewal of the exterior of our church facility. It consists of three major elements. The first is the creation of an enlarged patio space for improved fellowship and ministry engagement. Church patios are places to pray with a friend, to receive encouragement as a foster parent, and to help people connect with a life group or compassion ministry table. To triple the size of our fellowship space creates an improved context for ministry to happen. Secondly, Wave 3 will improve our entry to worship, creating an enlarged lobby space and the addition of architectural elements to show where to enter for worship. Thirdly, we will enjoy an improved and consistent design approach that will serve our church well for years to come. The Wave 3 renovations will demonstrate to our community that Grace is relevant in our day, rather than a relic from the past. This project has been in the works for over two years, as we worked through the city and state approval process. Now that the city has given us final approval on the permit to begin construction, we are moving forward with eagerness. A project implementation team of lay leaders have been interviewing potential general contractors, and we are currently in a bidding process with the finalists.